NNMAE.org • View topic - Boxcar, Sultan, or other SJ outings. Boxcar, Sultan, or other SJ outings. We're doing the Boxcar couloir on Saturday the 13th. It'll be my wife and I. If you are in the area and would be interested in meeting up just let me know. Re: Boxcar, Sultan, or other SJ outings. Please post your Sultan/Molas conditions. Couple of us are looking at the Sultans (upside down V couloir) and Naked Lady (south of Molas) for 25-27 Apr. Alternatively looking at La Plata Pk on the east side of Independence Pass too. Thanks! We've decided against the SJ outings Chrishami. We were just going for a night and a day, but can't justify it with the conditions. Like Kerry asked, please do post conditions. And, have a good trip. Kerry wrote: Please post your Sultan/Molas conditions. Couple of us are looking at the Sultans (upside down V couloir) and Naked Lady (south of Molas) for 25-27 Apr. Alternatively looking at La Plata Pk on the east side of Independence Pass too. Thanks! Sorry for the slow reply. I can't speak directly to those locations: I skied Red Mountain #3 on Friday April 12 and Anvil Mountain on Saturday the 13th. There was a backcountry snowboarding event going on all weekend around Silverton and so I do know for certain (without knowing exactly who rode what) people rode both the Wishbone (assuming that is the same as upside down V) as well as Naked Lady. The general consensus I heard was "variable conditions, average to good." Personally we found the snow above 11000 on N aspects was quite good, lower and more towards W was not so good. Then again, on Sunday up to a foot of fresh fell on Red Mountain pass, we did not go out that day as we were driving back home to NM. I do know there was additional snowfall yesterday on top of the Sun/Mon storm, as well as severe wind including dust this week, and so I have no idea of conditions at the moment. Seems like fresh windslabs might be the concern. CAIC is calling all aspects moderate at and above treeline. I am planning on heading up to the San Juans for Saturday, and possibly Sunday. Looks like both the conditions and weather will cooperate. Would love to have a partner. 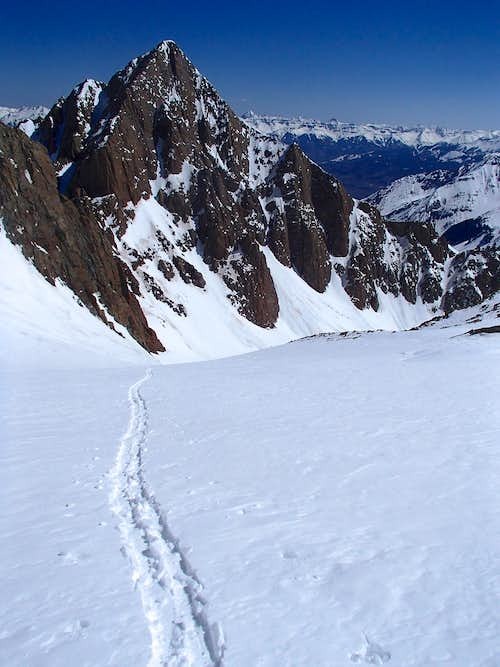 Currently my #1 goal is Boxcar Couloir on Wilson, and possibly a tour in the Sultan group. I'm open to similar option too. Give a holler if you may be interested. awesome, Dan. Glad you made it out there! scotthsu wrote: awesome, Dan. Glad you made it out there! Dan, not at this point, but will let you know if I end up there.